When AMD released their RX 460 GPU they decided to release it with only 14 of the GPUs 16 Compute Units (CUs) active, reducing the GPUs core/stream processor count from 1024 to 896, which is a decrease of 12.5%. Now Sapphire has decided to release an unlocked RX 460 to the Chinese market, unlocking the GPUs 128 extra GPU cores to offer additional performance to users. This new GPU will also come with 4GB of GDDR5 memory, allowing it to take advantage of high-resolution textures in modern games. This comes just a few months after the pro overclocker der8auer, discovered that he could unlock the RX 460's extra GPU cores with a custom BIOS update, in theory delivering a 12.5% performance boost to this budget oriented GPU. Combine this with a custom overclock and end users will have a huge performance gain over AMD's reference RX 460. AMD's RX 460 can be unlocked to gain 128 extra GPU cores, giving the GPU 12.5% more performance. These additional GPU cores can be unlocked using a GPU firmware/BIOS update, allowing gamers to unlock 8 additional TMUs and 128 stream processors for free. Like all GPU BIOS updates and major firmware changes, this upgrade places your GPU at risk, with BIOS flashing having the potential to damage your GPU and without any guarantee that your GPU's locked hardware will function properly. 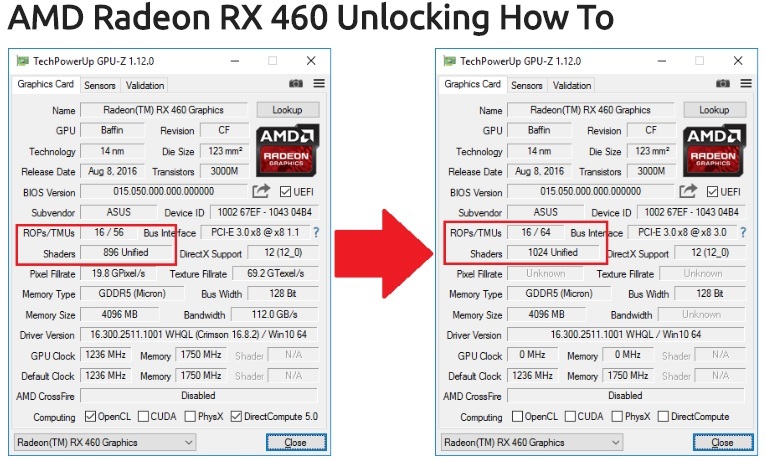 AMD locked down the RX 460 for a reason, with most RX 460 GPUs either having non-functional GPU cores or due to other reasons like power consumption or low yields. At this time BIOS updates have only been created for ASUS' RX 460 Strix 4GB and Sapphire's RX 460 Nitro 4GB, though it is likely that more BIOS updates will become available for additional GPU SKUs soon. Right now it is expected that Sapphire will only be releasing the RX 460 "unlocked edition" exclusively to the Chinese market. It is likely that AMD will be releasing a fully unlocked version of Polaris 11 in the near future, perhaps as a refreshed low-end RX 560 or an RX 550 SKU. This is merely speculation, but it would be a shame for AMD to let their full Polaris 11 GPU core go to waste. You can join the discussion on Sapphire's factory unlocked RX 460 on the OC3D Forums.